It could be said that The IIT campus is the place where post-war modern American architecture began. In 1938 Mies fled Germany, where the Nazis had shut down the Bauhaus, the modernist school where he'd taught, calling it an "aquarium of Jewish-Marxist art." He was looking for a place to land. After Walter Gropius beat him out for a key post at Harvard, Mies accepted an offer from the Armour Institute, now IIT, to head up its architecture school. During his first three years in Chicago, Mies lived in hotels. Most of his possessions remained in Germany. He was shy, and his tenuous command of English only made him seem more reserved. His requirements were few but refined: "Martinis, Havana cigars, and a few expensive suits led the list,"
writes biographer Franz Schulze. Asked by a student for his idea of a perfect place to live, he drew a quick, spare sketch of the interior of a plywood factory he remembered from Berlin, depicting himself settled in a chair atop a low stack of plywood, a series of small rising specks representing the smoke rings floating up from his cigar. Soon after his arrival Mies was asked to design the institute's new campus. The site, along State Street between 31st and 35th, wasn't exactly a coveted location. "When the campus was originally built everything east of State Street was walk-up tenement housing," says IIT's dean of architecture Donna Robertson. "They were slums." The new campus, she says, "was one of the first postwar federally funded urban-renewal projects. People don't know that." At the time urban renewal meant grinding troublesome districts into dust and starting over, in much the same way Le Corbusier had proposed leveling much of central Paris and replacing it with a Radiant Cityof towers rising out of gardens. Le Corbusier's plan did little more than enrage the citizens. Americans are much less sentimental, especially when an area is populated by poor blacks. Every building on the six-acre site was demolished, except the two used by Armour. Mies had been given the architect's dream, the tabula rasa, the blank slate, wiped clean of all the contaminations of the past. A 1942 photomontage shows the entire campus sitting on a flat plinth that separates it from the city around it. The plinth didn't make the final cut, but Mies returned to the concept throughout his career. He was more than willing to put his own buildings on a pedestal, even before anyone else was. projects, including a glass skyscraper and a concrete office block for Berlin. He called the IIT campus "the biggest decision I ever had to make." Not since Thomas Jefferson laid out the University of Virginia had a single architect used the opportunity to rethink completely rethought what a campus should look like. When the University of Chicago was founded in Hyde Park in 1890 architect Henry Ives Cobb turned his back on the commercial idiom of the Chicago School of Adler & Sullivan and Burnham & Root and built a campus modeled on old English colleges, entirely veneered in the Gothic style. The university had been created with the support of Marshall Field and Chicago's ruling elite, and its architecture needed only to reflect wealth and power in the most tastefully conservative way possible. The small, scrappy Armour Institute could claim no such pedigree, and its 34-year-old president, Henry Heald, was determined to create a new campus that would transform his college into a nationally recognized, modern university. Mies began by cataloging all the types of spaces and rooms the school would need, then designed a standard 24-foot-square module that could serve as a basic building block. A grid based on this module determined the placing of individual buildings. "That was a mechanical help," he said. "No one had to speculate where we put our columns." It also helped create a visual unity for all of the new structures, each of which would be made up of as many modules as were needed to support its functions. Mies was making a clean break with the romantic and the picturesque, with campuses fashioned after old villages. IIT would be rigorously modern-logical and linear. Mies's initial 1940 drawing of the campus was a rich display of the architectural vocabulary that was becoming known as the International Style. Long, thin buildings shielded the campus from the railroad tracks to the west. A squat, broad laboratory building got a spiky four-story tower. Lecture halls spread out behind labs like curving fans. Buildings were set on pilotis -slim, matchstick-like supports- that left the ground floor open. Several stairwells were constructed outside of buildings to allow a free flow of space within. All-glass curtain walls formed the skin of many of the structures, accented by brick spandrels in the end bays. On the north side of 33rd Street sat a spacious library with internal courtyards and exposed trusses rising above the roofline; on the south side a mirror building served as the student union. These two buildings formed a gateway that anchored the center of the campus. Mies collaborator and benefactor Phyllis Lambert, writing in the Mies in America catalog, found this first design "extraordinarily agitated and complicated." But it also has a visual richness missing in the campus that was finally built; it has the complexity and contradiction argued for by architect Robert Venturi, who changed Mies's dictum "less is more" to "less is a bore." But Mies was on a quest for the one great truth, for what Louis Sullivan's mathematics tutor called "demonstrations so broad as to admit of NO EXCEPTION!" Mies was aided in his quest by the slow pace of fund-raising and the pressure to reduce costs. The pilotis were among the first things to go, since they would have required adding a story to get back the space lost on the ground floor. The fan-shaped auditorium also disappeared. It was as if Mies were eliminating all the elements that had become visual signatures in the work of Le Corbusier. Construction didn't begin until 1941, on the Minerals and Metals Research Building. For the first time Mies used I-beams, the rolled-steel girders that would become a signature element in much of his later work. On the long walls the I-beams were concealed behind a curtain wall of glass and a base of continuous brick, but on the shorter end walls they were exposed, framing the brick infill in a sequence of rectangles that emphasized the structure of the building. At a time when structure was treated as a sort of impolite body part that had to be hidden behind an art deco facade, this was revolutionary. 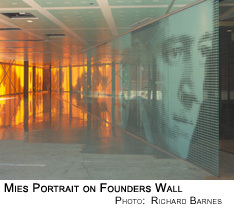 Lambert writes that the building "stunned members of the architectural profession in the United States," most of whom saw the end walls as an homage to artists like Mondrian and Theo van Doesburg rather than as a radical polemic for a new architecture drawing its vocabulary from the materials of the industrial age. As Mies said, "I have tried to make an architecture for a technological society." The simplicity of his design reflects Mies's belief that there's one best solution for every problem, and it can be discovered only through intense, dedicated study. Lambert writes, "In America, drawing became for Mies a way of thinking." More than 1,300 sheets of exploratory drawings were made for two IIT buildings, neither of which was built, but the solutions he finally discovered found expression in the 1945 Navy Building, now the Alumni Memorial Hall, his first classroom building for the campus. The city's building code - still carrying the memory s of the 1871 Chicago Fire, in which metal melted and buckled in the flames - prohibited leaving steel columns exposed if the structure was more than one story, so the I-beams had to be encased in concrete. Mies went from the direct to the poetic, spraying concrete on the columns, then facing them with black-painted steel to create the illusion of an exposed structure. Mies was also obsessed with how to "turn" the building's corners. He distinguished between two basic building types in his architecture. The Gothic, represented by the Minerals and Metal Research Building, was like the nave of a cathedral -a span longer than it was wide, composed of standard-sized modules commonly referred to in Mies's circle as "sausage," because they could be ground out to whatever length desired, then simply sliced off. Here the corner isn't really "turned": it's marked by the same I-beam mullions that runs all along the wall; it just happens to be the one at the end. The other building type was the Renaissance or Classical, a span with square bays, like the Navy Building, where the corners do "turn" as they define the endpoints of the building, making a clear transition from one face to the other. This is where Mies's philosophy of design and of life contrasts most clearly with the mind-set of our own time. An architect today, especially given the increasing use of computer design, can select from an almost infinite palette of solutions. Some will be better than others, but few architects would argue that there's one best solution waiting to be discovered like an alchemical formula. Mies believed there was and that the goal of architecture was to get as close to it as humanly possible. After countless sketches Mies arrived at the Classical corner, which he first used in the Navy Building. At the bottom a steel plate rests atop a short brick base. Atop the plate are the two outer sides of the concrete-insulated column, covered by a vertical steel angle; connected to the angle are a pair of I-beams that run in either direction from the midpoint of the encased column and carry the glass and brick that compose the building's exterior walls. All the steel pieces are welded together and painted black, forming a single, perfectly proportioned perpendicular transition from one wall to the next. This solution has become iconic. Pick up any major book on modern architecture and it's a good bet that somewhere inside you'll find a photo of the Mies corner. Big deal, you say? God is in the details, Mies answers. Mies would use the same idiom to build three more campus buildings Pearlstein, Wishnick, and Siegel halls-and four high-rise structures for student housing. The enormous influence these buildings had on modern architecture has made them invisible. At first glance they look just like any other generic industrial brick-and-glass structure. But only at IIT can you see them at the point of creation. As time went on, Mies grew frustrated that there wasn't funding for his most ambitious campus buildings, the Student Union and the Library. School officials shifted some of the student union's functions to the Commons Building, which would be built east of the campus, closer to the dorms. Informed that his own architecture department, originally part of the grand library building, was to be shunted off to its own one-story brick-and-glass box, Mies rebelled. No one actually called it that, or course, but it was Mies amuck. No longer satisfied to be good, he now demanded to be heroic. His new design broke the balance of the IIT site plan: the architecture school would be its most prominent building, though it was at what was then the most remote corner of the campus. Its main staircase even faced away from the other buildings. Mies also turned his back on his earlier austere, low-cost structures, insisting on a tour de force: Crown Hall, the crown jewel of IIT. An unlikely client had provided the precedent for the radical design. Lambert describes how Mies was enlisted in 1945 by Indiana movie-house mogul Joseph Cantor to design a fast-food drive-in restaurant that would stand out from the banal clutter along the highway. Mies came up with a dramatically long, lanky building whose interior space was free of columns. Its all-glass walls let the interior glow, drawing diners in from the darkness like bugs to a zapper. The most stunning element was the ingenious structure: a pair of huge open trusses mounted on four thin end columns that spanned the entire length of the building and carried below them a flat slab roof that cantilevered out over the driveway. The drive-in was never built, but its trusses became the exposed exoskeleton of Crown Hall-four 120-foot box girders, from which the roof of the 120-by-220-foot structure was hung. Mies had simplified his basic design yet again. 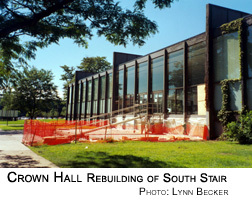 Crown Hall consists of a single room of 56,000 square feet, entirely enclosed in glass and completely free of interior columns. According to Franz Schulze, Mies saw it as a space that promoted shared values in the search for truth and was a response to the "chaos of directions" in the exterior world. The exposed structure of the earlier buildings may be too subtle to be noticed. Here he rubs your nose in it. Crown Hall remains one of Chicago's signature buildings. Chicago architect John Vinci was in the first class of students to use Crown Hall. He was part of a nonfraternity faction that had won an upset victory in the student council elections and was therefore responsible for putting on the school's annual I-Ball dance. They talked the school into letting them use Crown Hall for free, then took the $2,000 earmarked for renting a ballroom and booked Duke Ellington and his orchestra. Vinci and his classmates built the bandstand themselves, using scaffolding, wooden concrete forms, and plywood from his father's construction business and painting everything white. "Ellington and his musicians had to use a ladder to get to the platform," he says. "It was almost as high as the eight-foot oak partitions in the middle of the room." Vinci says the students from the school's Institute of Design were responsible for the decor. "They put blue and green spotlights on the grass outside and aimed them at the branches of the honey locust trees lining the building, so that inside you'd see the shadows of the branches moving behind the lower milk-glass windows like animated drawings on Japanese paper," he says. "The glass was only a quarter inch thick, half what it is today, and the wind or sound would actually make the glass wave. So you saw reflections of the lights and the musicians in the upper, clear panes of glass, and the reflections would move with the music. You walked in the 34th Street entrance, and you were right on the dance floor, in front of the bandstand." There was no talk that Ellington was so taken by the space he wanted to make a recording there, Ellington Under Glass, but the great musician never returned. Throughout the entire grand evening, relaxing in a Barcelona Chair, cigar in hand, sat Mies, happily taking in the great swirl of color and movement, light and sound, that shimmered in the clean, open embrace of his Crown Hall. It was the last structure Mies would be allowed to build at IIT. By 1958 his private practice was taking off, and according to Vinci, he wrote a letter announcement of his retirement as head of the architecture school so he could devote more time to his firm, though he emphasized that he still wanted to finish the campus. As Vinci tells the story, "Bill Hartman, who was then head of Skidmore, Owings & Merrill, took Mies to lunch, and he asked him, 'If you don't finish the campus, what would you say if we did it?'" Mies, always polite and nonconfrontational, replied, "Well, Bill, if I can't do it, certainly it would be fine if you took it on." Vinci says Hartman took this to IIT president John Rettaliata as a blanket endorsement for SOM taking over. He says Rettaliata already considered Mies a liability because his shyness made him uncomfortable with schmoozing at fund-raisers, and so he ignored Mies's request to continue on as campus architect. Soon the commissions for the two buildings that were arguably closest to Mies's heart-the library and the student union-were in the hands of SOM. 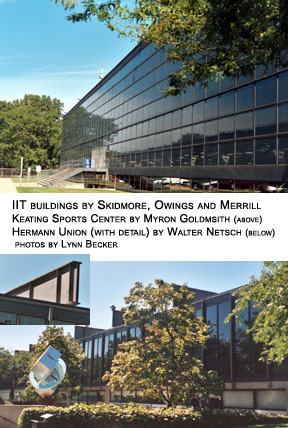 Over the next decade the buildings added to the campus followed Mies's idiom - sensitively and creatively in Myron Goldsmith's Keating Sports Center, less gracefully in Walter Netsch's Galvin Library and Hermann Union. But by the time of Mies's death in 1969, construction was at an end. Alfred Caldwell's plans for landscaping the campus were never fully realized, and the strip east of State gradually became a parking lot. The area around the school continued to decline, and slowly IIT became the campus time forgot. By 1998 enrollment had dropped to 3,000 students-half the number in 1941, when the campus was less than half the size. A 1997 national survey of college students proclaimed IIT America's "least-beautiful" campus. "I heard that it was the most boring campus in the U.S.," says undergraduate Robert Guico, "that it was run-down and designed poorly and that architecturally it was pretty dismal." In 1993 the school set up a national commission made up of trustees, faculty, and outside experts to "shape the next century of IIT at a time of declining enrollment." In 1996 it launched the IIT Challenge campaign to raise $250 million, jump-started by a $120 million grant from the families of alumni Robert Pritzker and Robert Galvin, of Motorola. That same year architect Dirk Lohan, Mies's grandson, presented a new master plan for the campus, and soon after, 56 architects, including local firms and a usual-suspects international roster, were invited to participate in a competition funded by the Richard H. Driehaus Foundation to design one of the plan's key components, a new student center. It had to be built at 33rd and State, provide 100,000 to 125,000 feet of space, and be "a place for students' academic and social lives to converge," which meant including food services, student lounges, a bookstore, an auditorium, and recreation facilities. The structure was to be three to four stories high, to "mitigate" the effects of the "L." And it was to contain a "virtual Mies museum" that would explain his legacy "in an experimental environment." Thirty-nine architects responded to the invitation. Of the five finalists named in August 1997, Helmut Jahn was the only Chicago architect to make the cut, joining Kazuyo Sejima and Ryue Nishizawa from Japan and global superstars Peter Eisenman, Zaha Hadid, and Koolhaas. Eisenman, famous for the concept of deconstruction in architecture, spoke in his presentation about the challenge of building at a location that's become a Miesian shrine. "I have this oedipal complex," he said. "I need, in a sense, to overcome daddy by also respecting daddy. You don't just stick your tongue out at him, or then you don't respect yourself." Eisenman's response to the Mies campus-and to the noise of the "L" - was to hide from it, burying his building below grade and leaving only a series of striking, diamond-like skylight entrances on the surface of a broad public plaza. Mies's legacy was reflected most directly in Jahn's design, a masterful updating of the classic Miesian design (Jahn was later awarded the commission for IIT's State Street Village). But in February 1998 the six-member jury, which included Phyllis Lambert, awarded the commission to Koolhaas. That choice made the student center the focus of the ongoing debate about the validity of Mies's ideas and the direction of modern architecture. © Copyright 2003-2005 Lynn Becker All rights reserved.